Both types of companies will improve operating efficiency, morale and results through regular revisits to core overlapping principals that drive their business. By using tools and methods that do not consume excessive time, companies can gain greater ROI on the time spent managing their business. More importantly they can actually regularly review where they are, what they stand for and where they are going. Deciding what not to do, is the biggest barrier to success for most business owners. 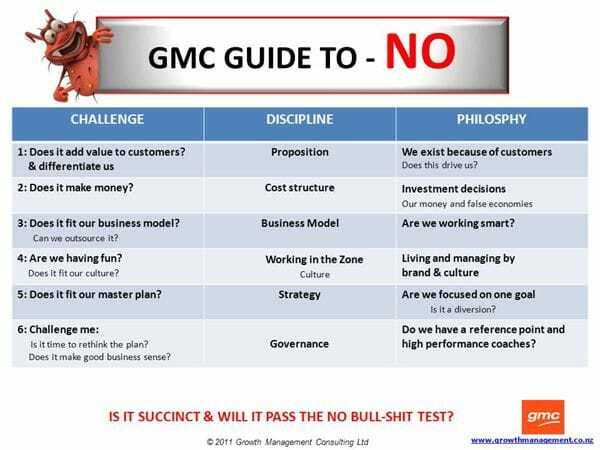 Check your last three decisions against the GMC guide to NO. Growth Management Consulting (GMC) work with clients: either in intensive workshops or an ongoing basis to implement effective leadership, management and marketing practice. Contact us here to find out how we can help your business achieve success.